In celebration of Open Access Week 2013, BCLA’s Information Policy Committee is bringing back the IPC salon. Our salons are informal gatherings where interested people come together learn more about important (or just exciting!) issues around information policy. Fun, debate, and discussion are enthusiastically encouraged. 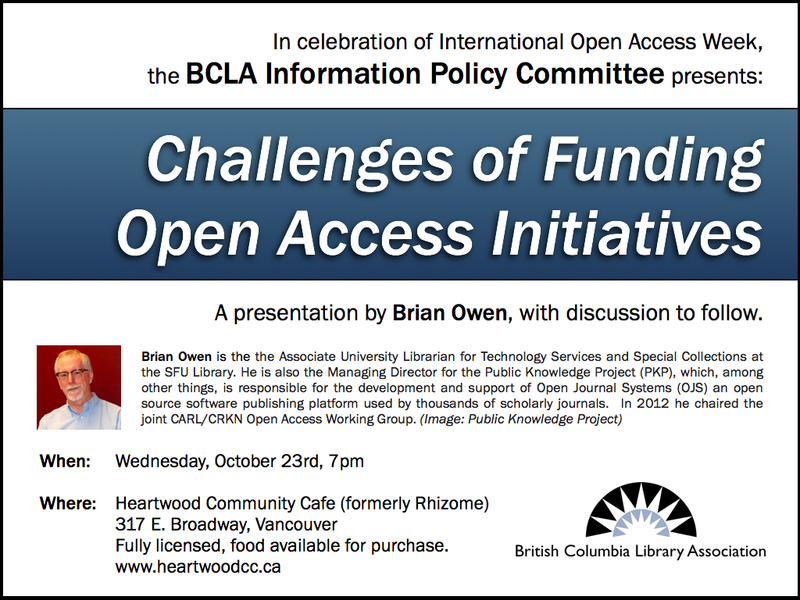 The IPC is very excited to welcome Brian Owen for our first salon; Brian will be speaking about “challenges of funding and sustaining open access initiatives”, with a discussion to follow. Who: Brian Owen is the Associate University Librarian for Technology Services and Special Collections at the SFU Library. He is also the Managing Director for the Public Knowledge Project (PKP), which, among other things, is responsible for the development and support of Open Journal Systems (OJS), an open source software publishing platform used by thousands of scholarly journals. He is an Associate with SFU’s Canadian Centre for Studies in Publishing and SFU’s Master of Publishing Program. In 2012 he chaired the joint CARL/CRKN Open Access Working Group. Please join us (and join us in thanking Allison Trumble for the work she’s been putting in as the IPC Salon Coordinator)! One would think that the publication of old census data would be a great thing for information professionals. Since our federal government has decided to scrap the long-form census in our current days, at least there’s the old data for people to examine and play with. Including cool stuff like the complete 1921 Canadian Census which Library and Archives Canada have now made available for all Canadians, since that’s their job, right? Before we get into the choices let’s just mention that everything involved here is stuff Canadians have already paid for. This is a small part of what taxes are for: Collecting information important to Canadians and making it accessible to them. That’s the service here. But LAC has sold this to a private company. So now, you will have access to the data through LAC or other libraries that pay Ancestry for the privilege of accessing the search tools. In most libraries you need to be on-site for the privilege of searching through information that is supposed to be every Canadian’s. LAC is so happy to tell you that you “only” have to pay to search the information if you want to do it at home. And don’t forget you aren’t paying LAC for this, but Ancestry, a private company. In a perfect world far from this vale of tears, the information in the census would be indexed and searchable and remixable and free for all. If this was being done as a government service maybe it could be. They would need more librarians and other experts because this kind of thing doesn’t cost nothing, but rather than creating something for Canadians, Library and Archives Canada hands it over to a private company to make money off of. A national library is supposed to be a leader, but shrinking the institutional vision down to merely adding to private companies’ revenue streams is not leadership behaviour. Policies that work towards actual Open Access that helps develop culture instead of commodifying it is what we want. At this point (as with the Heritage project we’ve discussed here before) there’s no transparency as to what kind of exclusivity Ancestry gets in regards to this data or who is actually creating the metadata or any of the details. What is to be done about this? I don’t know. When I’ve talked with librarians about issues with LAC in the past they’ve said things like “Well, they don’t have any money.” We need to reframe this debate. We’re librarians and our job (if I may be preachy and idealistic for a moment) is not to generate revenue but to disseminate information within our communities. If we’re forced to do both, one of them is getting short-changed. At the very least we should be pointing out the lies about “free access” when it is actually paid for by libraries. And we’re paying twice.